After a successful and exciting year that was 2011, the Word N Sound Poetry and Live Music Series is back and brings you two uniquely talented voices in the local poetry scene. The search for emerging new writers and performers has become synonymous with the Word N Sound brand. Last year saw the best of this city’s young voices compete for the coveted Queen/King of the Mic. The completion was tough and the battle gruelling giving the best entertainment to a captive audience. 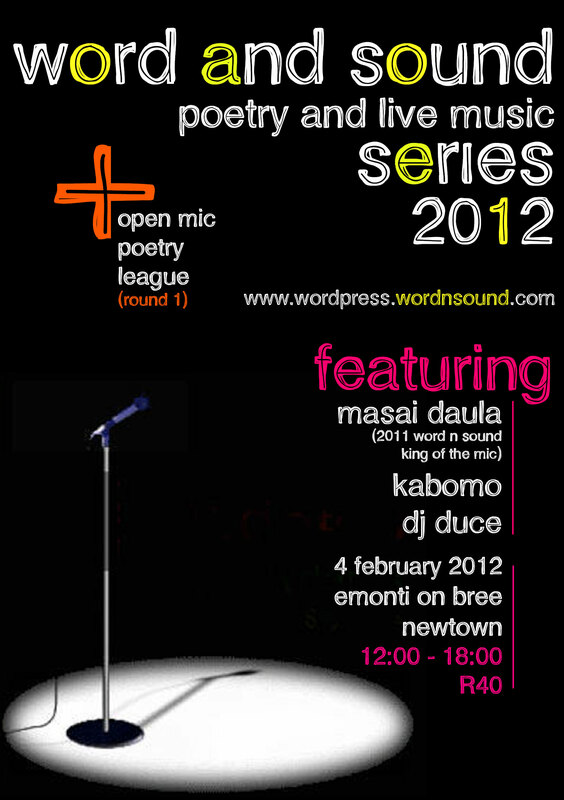 This year we see a return of this competition in the form of the Word N Sound Open Mic Poetry League. There are only 20 spots open, so get their early to secure a place n Jozi’s most challenging search for sheer talent. Masai Dabula is no stranger to the Word N Sound stage. He dominated last year’s open mic challenge eventually taking the ultimate title of Word N Sound’s 2011 King of the Mic and an 8 day trip to Baltimore for a unique arts exchange program in March 2012. Having been raised in a family of MK vetarans, his writing is adjured by the struggle of the common man. From 2008 he started performing on the streets with his collective (The Street Poet Movement) tagging poetry on walls, giving people pamphlets of poetry on street corners, protesting against abortion and giving a helping hand to the needy. His main purpose in life is to use poetry to kill and heal whilst clinging on to the righteous truth.. Some of his work can be found in an anthology called the ”Grounds Ear” and ”God brought me here to free the slave masters so that he/she frees the slaves”. After 10 years of working behind the scenes in the entertainment industry, known as a creative schizophrenic for his many talents, Kabomo (singer, emcee, poet, producer, writer, filmmaker, actor, public speaker) has taken the step to release what is undoubtedly the most anticipated collection of songs to date. With a sound like no other in the market, the multi-talented musician and producer has finally released his debut album ALL THINGS GREY. Catch him on the 4th of February as he graces the Word N Sound stage. Emonti Diner on Bree is situated on the outskirts of Newtown and is poised to be the new hub for young and emerging talent with their various band nights, dj events and now the new home of the Word N Sound Poetry and Live Music Series. We have launched our blog for the year and look forward to sharing new work and an exchange of ideas as we grow the local poetry and live music scene. Visit www.wordpress.wordnsound.com for more information on this growing dynamic movement. Word N Sound Series is a poetry and music development platform which includes a monthly showcase of various accomplished writers, poets and bands. Since its inception in November 2010, Word N Sound has staged various well known poets and bands including Kojo Baffoe, Lesego Rampolokeng, Mak Manaka, Antonio Lyons, Khethi, The Fridge, Clint Smith, Tu Nokwe, Lebo Mashile, Myesha Jenkins, Kgafela Oa Magogodi, 1947 and Natalia Molebatsi and the Soul Making to name a few. Word N Sound Poetry and Music Series is a platform for the expression of spoken word, not so much a commercial venture as an attempt to make a positive impact on youth in the city. As a cultural form the craft draws on ancestral oral traditions and fuses with modern music genres such as jazz, house music and hip hop which are a global phenomenon. It functions as a conduit for the aspirations of a marginalized generation and teaches young people to articulate their ideas. In a country with such a low literacy rate, spoken word encourages curiosity and exposes people to literature in English from a range of cultures around the world. Writing is central to every profession so this is a key skill across all sectors. The Word N Sound platforms bring together older practitioners of literature – elders of 40 years and older – with young people in their teens and early twenties, to encourage and inspire them and to give them a sense of the trajectory of a literary career.